You are here: Home / Giveaway / Why Shopping at Food Basics Just Got Easier for Everyone + Giveaway! Tips to Plan Your Weekly Shopping Trip! How many of you do a weekly shopping trip? I would say most of us do some sort of weekly shopping trip to the grocery store. If not weekly, then bi-weekly or monthly. Shopping at Food Basics, helps me save money. Especially when I scope out and find great deals and there are various ways I do this. I wanted to share a few tips for making your weekly shopping trip successful. Know the place you’re shopping at – Don’t just shop at random stores each week. Get to know the store you’re shopping at. The more you know, the more you can save. When I shop at a store that I know nothing about, I feel like a fish out of water. 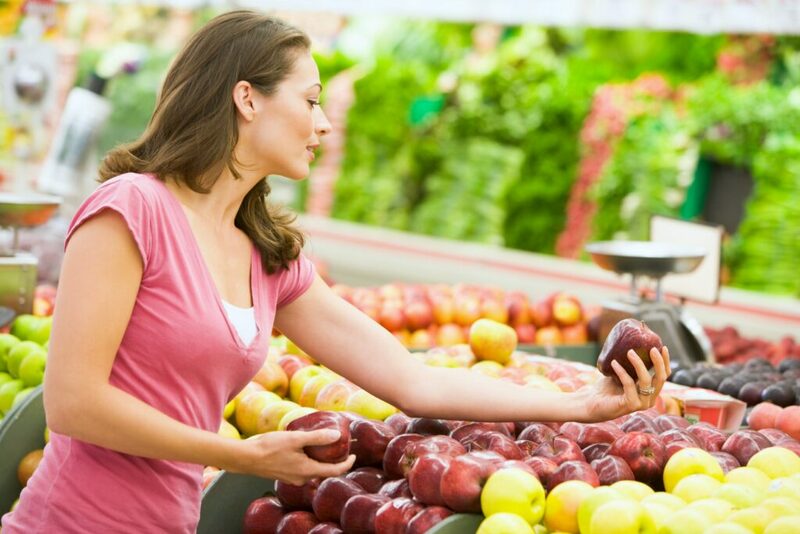 Get to know your store and you will be much more successful with your weekly shopping. Make a list of what you’re shopping for – A lot of times, you can go right to the website and look at the weekly deals or access their e-flyer. This helps plan your weekly shopping trip. I can find the best deals and even look for coupons. Some grocery stores are even coming up with apps to make this even easier! More on that below. Shop at Food Basics – One of my favourite places to shop is at Food Basics. In fact, it’s where we do our weekly shopping. When I save money on grocery shopping, I truly feel like I can have it all. Read on to find out why Food Basics is my preferred store to shop at! Raise your hand if you love shopping at Food Basics! It’s one of my go-to places to shop. I love it just the way it is, but the amazing people at Food Basics are making things even more awesome. FoodBasics.ca. is going through a fresh new design that’s going to knock your socks off. Not only have they done a redesign, but they have also done something else that I think you’re going to love. 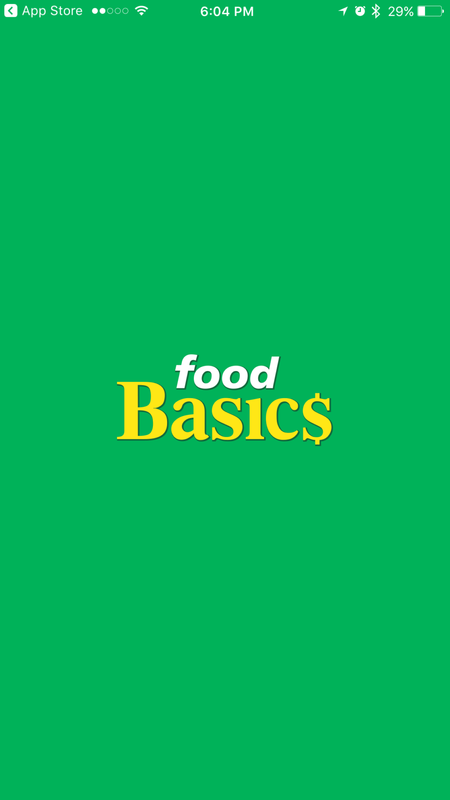 Here is the down low on how Food Basics is changing and how it will make your life that much more awesome AND easier. This is one of my favourite ways that Food Basics is changing. An app makes everyone’s life easier. This app will be available on Android and the iPhone. There is a handy dandy store locater, so you can find a store near you a lot easier. 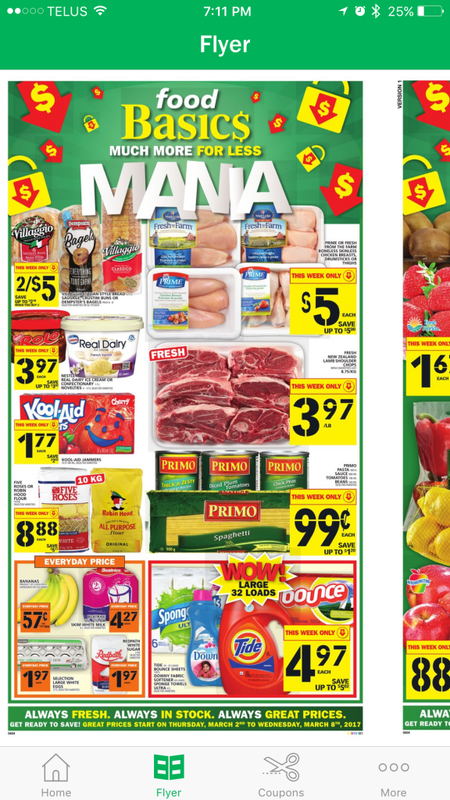 You will also have access to grocery flyers and coupons to use in store. Clipping coupons has never been so easy! All you have to do is press the little scissor icon and it automatically adds it to a folder for your clipped coupons. Being able to browse the flyers by a touch of a button is so helpful too. Having the flyer accessible can help you formulate your shopping list or refine it. Flipping through the flyers is more like swiping across and if you see an item you like, you just click on it and you get all the deets. Like what it is, how many come with it and the price of course. Plus, you find out what is on sale! Flipping through the flyers is more like swiping across and if you see an item you like, you just click on it and you get all the deets. Like what it is, how many come with it and the price of course. Plus, you find out what is on sale! Shopping this way, really ups your saving game! Make sure to download the app to make your shopping trip so much easier. You can get it in the Apple Store and Google Play. Food Basics has also redesigned their website, which is great. I like the crisp and clean look of their new site. I love that you can subscribe to their e-flyer. You can do all sorts of stuff on their new website. You can have easy access via your phone, tablet, or computer. I can say that it is easy to navigate through everything. How many of you are already on Facebook? I bet you like it when your favourite companies are also on Facebook, I know I do. Food Basics has joined Facebook and this is where they will post upcoming contests and so much more. I also love that you can get in touch with a rep if you need it. Make sure to “like” them for all of their latest updates, here. This contest is open to Ontario only, as Food Basics is only in Ontario. It starts on March 6 and ends on March 22. Happy Entering! Now you can shop smart at Food Basics. I have always been able to find fresh food there, which is important to me. Another thing I love is their customer service is always on point. I never have to worry about things going wrong there because they always treat me right. Food Basics is a valuable place to shop and they’ll have my money for many years to come. Now that they have gone even more digital, I’m hooked! Do you go online before your shopping trip? With the extra money I saved I would put it towards the following weeks groceries. Always good to get ahead! I love that this app has a store locator and that you no longer have to clip coupons just click a button! how awesome. Love the flyer portion of the app! I love that you can clip coupons. It is a fantastic feature! I would use the money I save to buy some Christmas and birthday presents! A year goes by so fast, before you know it, it’s Christmas again! I like that you can add all your coupons to a folder! I really like the coupons being electronic! I think that will be so handy and easier to use since they would have to read each coupon to ensure that it is valid.. 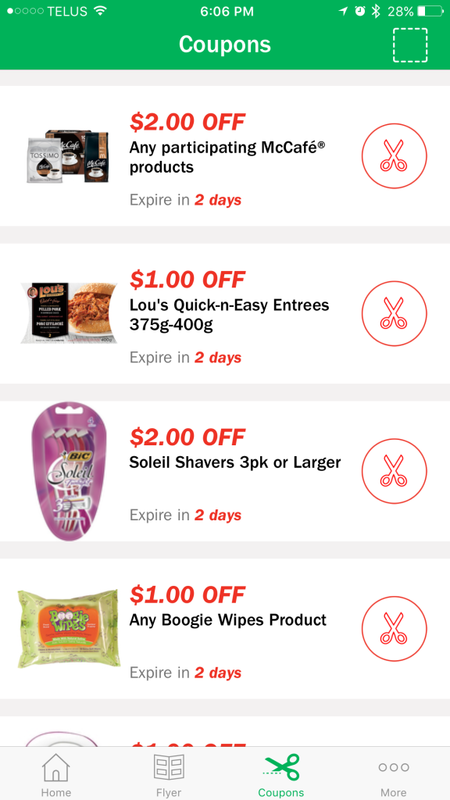 I love the app,it’s great for price matching and coupons. I would love to set the money aside for future vacation, but they most likely will go into groceries. I do shop at Food Basics every week because they always have great advertised specials and that way I can afford to stock up on the items we need, when they’re on sale. We’re seniors living on a fixed income and need to cut down on spending wherever possible. I am glad you are able to find good deals! I would use my savings from Food Basics to pay off bills. I like that I don’t have to physically carry printed coupons, I love having them on my phone. I will definitely be using the app and what I save will go towards our Return to Great Wolf Lodge A.S.A.P. fund! My phone was recently dropped and it became unusable. The extra money I would save will go to more groceries or perhaps a new phone. Food Basics is where we do almost all our shopping! I’d stock up the freezer…meat and bread! Thankyou. I’d use the money I saved for a haircut! Awesome! WIth the extra funds I would get some treats for my next girls’ night in (cheese, crackers, juice, popcorn, fruit, etc)! I would spend the money I save on taking my kids to the movies! With the extra money I save at Food Basics, I would put it towards some day trips this summer. The coupons are really neat , loving the new re design of the app. I try to have a bowl of fruits every other day. The extra cash would be useful for that. The extra funds would go towards an upcoming summer trip. I would use the money I saved to get some of the camping supplies we need for this summer. I would use the extra savings to stock up on freezer items when they’re on sale … like meatballs and chicken nuggets for school lunches! As a family of 6, we spend A LOT on groceries so this would really help us out! So would the coupon app because I am always leaving my coupons at home! I would put the extra money aside to go somewhere special with my family. i would love to use the extra money towards our vacation fund! I would use the money i save to buy something nice for myself. More savings only means more items can go in my grocery cart. Im excited for the coupons from the app. I already save at Food Basics and this will save me even more. i would use the extra $ for a trip. I’d love to splurge on some extras with the extra money! Like to use savings for vacation time. Love the clipping coupon feature of the Food Basic App. Going to have to download it. I would treat myself to a massage with the extra money I save at Food Basics! I would add the saved money to the general household revenue – yes I am that boring. This app looks amazing! I think the extra money saved would go towards MORE groceries! With 5 of us and a tight budget, it would be nice to splurge every once in a while! Ill use the extra money to buy myself a new purse. Maybe we’d splurge on some extras that we don’t normally treat ourselves to at the grocery store! I’ll most likely use the money for groceries. The money i save at food basic’s i would save for a summer road trip. Would pick up some of the extra supplies we need for camping this summer with the extra money. I like the coupon clipping part. I always have a vacation fund on the go, the extra savings would go into that. A fun night of bowling with the kids would be a great way to spend it! I am excited that I can save money at a store that I love near by. The extra money would definitely be well spent on some camping supplies we need. I love the convenience and the coupon feature on the app. Would love to get some chips and dip for movie night! I would love to put the additional money on a small loan that I’m trying to get rid of. We are getting ready for camping season so the extra money would go towards getting those supplies. The app’s store locator is super handy! I would use my extra money today to hire someone to shovel me out,wow it’s been a blizzard here since Thursday night and today it seems worst than ever. it would go towards our wedding fund!! I really great dinner out would be a nice way to spend the money! I love that the coupons are available right inside the app! I’m excited about the coupon portion of the app! I love the store locator on the app! Family Movie night is a great way to spend the money I would save! The extra money would definitely help to stock up for our camping this summer. With the money i save i will treat hubby to a nice dinner and a movie !! I love the flyer option! the extra $$ would be for our upcoming summer vacation. There are so many ways I could use an extra hundred bucks! Including toward a shopping trip toward new clothes as I have been losing weight and is soon time for a new wardrobe! Great reward idea! I’m saving up my savings for a much needed vacation. Definitely love the coupons, any little bit that I can save is great. With the extra money I would save at Food Basic’s I would either go out for dinner at a restaurant or by even more groceries! I like how you can “clip” coupons in the app! I’d buy more groceries with the money I saved. the extra money would probably go to my credit card. The extra money would be great to put towards camping supplies we need. i would spend the money i save on taking my hubby to a movie ! I’ll use the money for groceries. I would use the savings from Food Basics to buy extra food. 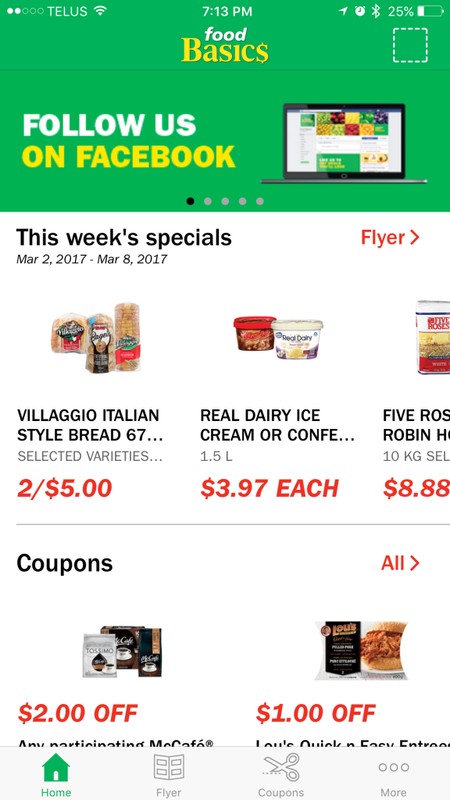 I love the app No more coupons or flyers to carry or forget. I’d buy some new shoes. I might put the extra money on the credit card. With extra money I saved I would buy some presents for the grandkids. I’d put the money I saved towards gardening supplies. I would buy a food basic gift card with the extra money. I would stock up on some goodies for camping this summer! I would save the money for future needs! i love the coupon portion of the app. Love the electronic coupon feature! I like that you can save your coupons to a folder. I’ll use the money for groceries! The extra money would be great to help with camping supplies we need to get for the season. I’d buy a new spring coat. The extra money would come in handy to stock up on some camping supplies. I would put the extra money on debt. I will use the money for groceries. Love that the app has coupons and looks easy to use. With the money i save maybe a will treat myself to a spa day! I’ll most likely get the groceries. I love the opportunity to use digital coupons! Thanks for the giveaway and for your entertaining and informative posts! Extra money would help stock up for camping! I love that I can clip coupons to use while browsing their flier. Awesome little app! I would stock up on specials at Food Basics if I win this terrific prize. I really really love the coupon clipping. I already save a ton of money shopping at food basics but adding coupon clippings is amazing! I had no idea they had this! The extra money would be great to pick up groceries for camping. I love the coupon and price matching portion of the great app !